May be a trend...another recipe that is all about the dressing. Sort of. That is to say, the dressing is what I most want to remember and share for its uniqueness, at least to me. Until now I didn’t make the tahini-balsamic combo a regular in meal planning. I am definitely going to be making up for lost time moving forward. There is another beauty of a bonus, too: built-in is a major shortcut if needed. If it’s one of those days when the mere step of whizzing up a dressing has you feeling limp and listless, you can relax and refuel faster knowing this salad is so very forgiving. Just about any dressing will do. Whatever ready-made vinaigrette you wish (just stay away from the sweet ones), Italian,a splash of plain lemon juice and oil, or my personal favorite, the marinade from artichokes. But if you do feel fresh and awake enough to whisk a few ingredients separately in a bowl, or process them till smooth, tahini-balsamic has a simple way of elevating every quinoa seed and spinach leaf with rich, tangy, nuttiness. Cook quinoa: add 2 cups water in a medium saucepan and bring to a boil. Reduce heat to low, cover and summer until tender and most of the liquid has been absorbed. Transfer to a large salad bowl. 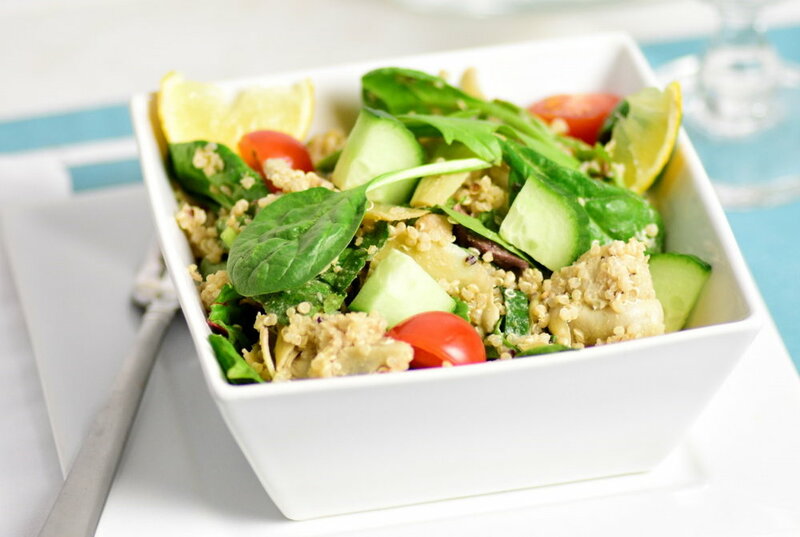 Add greens, tomatoes, cucumber, olives, artichokes and chickpeas to quinoa in bowl. Prepare the dressing: place tahini, water, vinegar, soy sauce and garlic powder in a food processor and blend until smooth. Season with salt and pepper to taste. Toss quinoa mixture with dressing prior to serving.